Bluetooth-compatible wireless keyboard is designed for use with your iPad. 78-key design offers a wireless connection to every tablet. The iPad 2-in-1 support comes with a built-in rechargeable battery for continuous 12-hour operation and a sturdy stand. 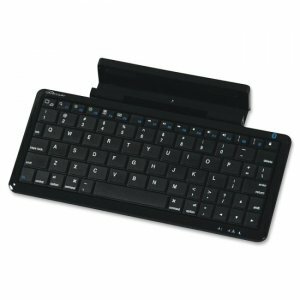 Keyboard includes a retractable mini-USB cable for recharging the keyboard batteries from a 5V USB port.